EDIT: This giveaway is over! The winners have been sent friend requests on Steam and will get their gift key there. We’re giving away 3 top tier Humble bundles (one of each) to 3 lucky members of our Steam group! The giveaway starts now, and the winners will be randomly decided tomorrow, January 23rd, and contacted via Steam with their gift codes! To play, first make sure you’re a member of our Steam group, then just comment below your Steam username and which bundle you want! Of course, we wish good luck to everyone, but there can be only 3 winners. To everyone else, better luck in the next giveaway – we plan to do these at least once a month. Humble Hope for Orphans Bundle – You’ll get awesome games like Rising Storm 2: Vietnam, Killing Floor 2, BLACKHOLE, and more! Then, proceeds from this bundle will help provide care, life skills coaching, and housing and education resources to young people who have been left without support systems. – goes to nedioneddef! Congrats! 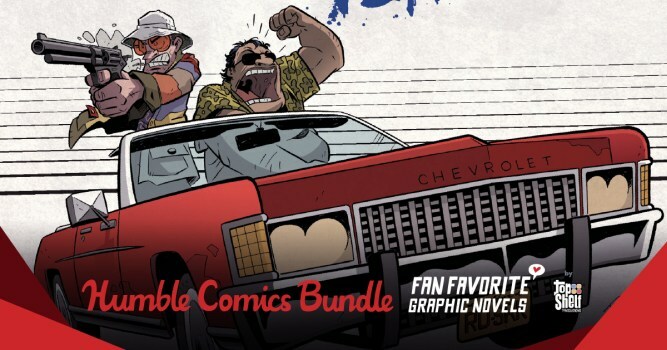 Humble Comics Bundle: Fan Favorite Graphic Novels – Grab a bundle of fan favorite titles from our friends at Top Shelf Productions, including Hunter S. Thompson’s Fear and Loathing in Las Vegas, Apocrypha Now, Clumsy, WIZZYWIG: Portrait of a Serial Hacker, and more. Life is good at the top! – goes to DaemonlordX! Congrats! Humble Manga Bundle: Attack on Titan Universe – Pick up volumes 1-22 of Attack on Titan, plus titles like Before the Fall and Lost Girls. Then, feed your appetite with the hard-to find Attack on Titan Guidebook: Inside & Outside and Spoof on Titan. For even more colossal value, gobble up the Humble exclusive Attack on Titan: Exclusive Artbook! – goes to linqueo! Congrats! If you subscribe to next months Humble Monthly Bundle for February 2018, you’ll get Sid Meier’s Civilization VI, the Australia Civilization & Scenario Pack, and the Vikings Scenario Pack! as early unlocks right away, and the rest of the mystery games once the bundle is revealed. Vincent13122, thank you so much 😀 I’d love to get the hope for orphans bundle! Humble Hope for Orphans bundle! Prod (steam name) – Humble Hope for Orphans Bundle. I’d like the Hope for Orphans Bundle. Can i Have please the Humble Hope for Orphans Bundle? Humble Hope for Orphans Bundle. Good luck to everyone! Thanks for the giveaways, IGB! Choice: Humble Comics Bundle: Fan Favorite Graphic Novels Bundle. Otherwise if you end up with a spare Humble Hope for Orphans Bundle I’ll gift the codes to friends and family! Thanks for the chance! Good luck all! Hello there, thanks for the chance! Count me in for the Humble Hope for Orphans Bundle. I want Humble Hope for Orphans Bundle. My Steam nickname is ArtemMZ. Thank you all for playing.Congrats to the winners!